‘Anonymous Source’ On Bonds ~ Brother, Can You Spare $6 Trillion? It has been asked by ‘Anonymous Source’ that ‘We The People’ of the World make all this information viral as I put it out!! Thanks to all Lightworkers for your help with this! ROME — The Italian police on Friday arrested eight people on charges related to the seizure of $6 trillion in fake United States Treasury bonds, in a mysterious scheme that stretched from Hong Kong to Switzerland to the southern Italian region of Basilicata. In a statement on Friday, the United States Embassy in Rome said its experts had examined the bonds, which bore the date 1934, and determined that they were fictitious and apparently part of a scheme intended to defraud Swiss banks. It was unclear whether the bonds were ever used for that purpose. The arrests on Friday, on fraud and related charges, were part of a broader investigation of organized crime in the Basilicata region, the instep of Italy’s boot, prosecutors in Potenza said in an e-mailed statement. “We had heard that they weighed a lot, but frankly we didn’t expect to find that kind of material,” Giovanni Colangelo, the chief prosecutor in Potenza, said in a telephone interview on Friday. He said that prosecutors had heard about the fake bonds through wiretapped phone conversations. In 2010, the authorities in the Lazio region seized four fake bonds, each printed with the value of $500 million, but he said the mother lode was found in the vaults moved from Switzerland last fall. One of the eight men arrested had moved the $6 trillion in fictitious bonds from Hong Kong to a Swiss deposit in 2006, Mr. Colangelo said. He said the origins of the bonds were unknown, but added that authorities had also seized a fake will, which was said to be part of a scheme in which a suspect would claim to have inherited the bonds and try to use them to open credit lines at a bank. Prosecutors said they had also picked up wiretapped phone conversations in which the suspects talked about buying plutonium from Nigerian sources. They did not provide further details, but Mr. Colangelo said their efforts did not come to fruition. According to the Federal Reserve, such “fictitious instrument fraud” is increasingly common, and unwitting investors have been cheated of nearly $10 billion in recent years. In a common ploy, “criminals present fictitious financial instruments such as Federal Reserve notes, standby letters of credit, prime bank guarantees or prime bank notes in order to fraudulently collateralize loans,” the Federal Reserve says on its Web site. 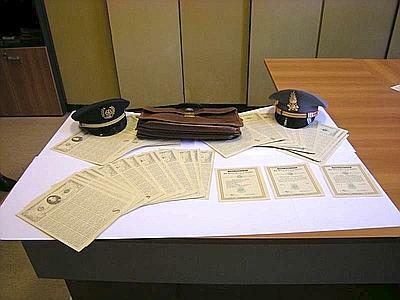 In 2009, Italian police seized phony United States Treasury bonds with a face value of $250 billion. Note: There is a major problem with the claim that these are fake. If you were a counterfeiter and wanted to fake bonds, you would have to be out of your mind to fake them in denominations of $1 billion. As reported here, no one would ever dream of cashing them. For excellent research by David Wilcock suggesting that the bonds are real, and that this may be part of a huge, hidden manipulation. Read below as they are connected…. UPDATE SATURDAY 5:15 PM: My phone has been literally ringing off the hook since I made these announcements. I am getting calls stacked up on call waiting just while I’m trying to complete the ones I’m already in. This has been very distracting! I do not believe I am in danger any longer. This article now has 350,000 hits and I was told that anything over 200,000 would practically guarantee no one would come after me. I am scrambling to finish Part Two and will probably have it out tomorrow. I highly recommend you watch this first, as it will draw you directly into the mystery — which flickered for the briefest moment in mainstream media, only to disappear into shuddering silence:….